The Performance Arts Center Lobby offers light and transparency, elements that contrast strongly with the opaque volumes of the existing Fine Arts Center, a 1960s design by Roche Dinkeloo. The project is conceived of as three glass boxes arranged to create a transparent link between upper and lower campuses, and to reconcile the disparate scales of the Concert Hall and the Rand Theater. Suspended plaster lanterns fill the space with softly reflected colors by day and with saturated, projected colors at night. Large expanses of glazing are wonderful for bringing in quantities of natural light, but they require design strategies to prevent solar gain, solar glare, and heat loss. The design concept for the new lobby is of a transparent glass volume inserted into an existing concrete mass. 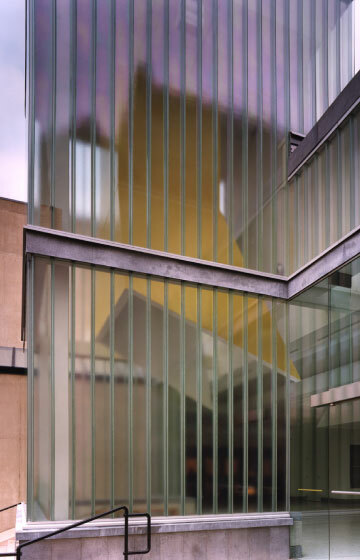 Channel glass, folded and combined in thick, interconnected panes, allows this design by achieving a balance between the desired level of illumination and the negative effects of too much daylight.